We are proud to present the 2018-19 Neshaminy High School Marching Band. This year the band is comprised of 121 members, which includes 106 musicians and 15 color guard. The band is directed on the field by Drum Majors Daniel Aungst and Jordyn Sounder and Field Captain Chris McVey. The band director is Michael Lipton. Band staff includes Lisa Boccuti, Justin Aungst, Josh Campbell, Robert Lazenbury Megan Reilly, Dan Fullman, Katie Gallagher, Bennett Stump, Matt Snyder, Michael Allen and Kate Currie. Musical book is by Synced Up Designs. Percussion arrangements are edited by Josh Campbell. Front Ensemble arrangements are edited by Bennett Stump. Drill design is by Tim Darbonne. 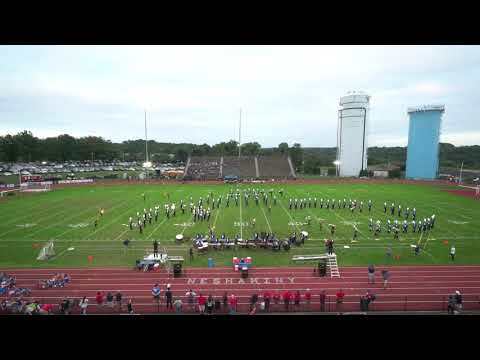 The Marching Band will be kept busy this fall with performances at all Redskin football games as well as participating in Marching Band Shows at Upper Dublin, Downingtown West, Plymouth Whitemarsh, Council Rock, William Tennent and Conestoga High Schools. We will host our own 26th Annual Kaleidoscope of Bands Show on Saturday, October 27, 2018. In our 2018 production, we take a journey through the Norse afterlife to the hall of Valhalla. In Norse mythology, half of those who die in battle are chosen by the god Odin to live out their afterlife in this majestic hall. Those who are chosen are led by Valkyries to Valhalla to join the masses of those who died in combat, along with legendary heroes and kings as they prepare to aid Odin during the events of Ragnarök. Please sit back and enjoy our presentation of Voyage to Valhalla.